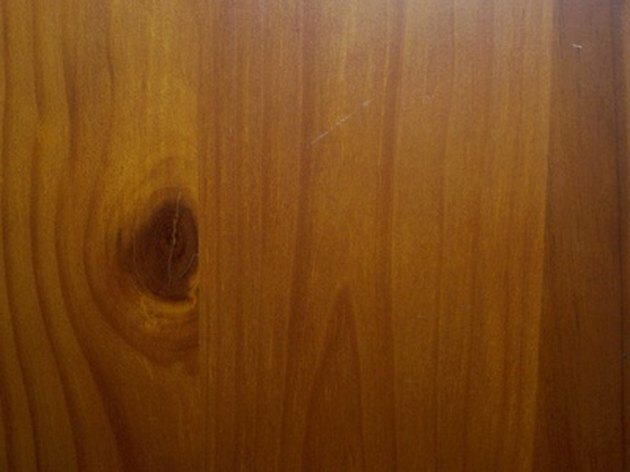 Wood paneling can be damaged over time by scratches, gouges and holes. Furniture, door knobs or wear and tear are among many things that might cause damage to paneled walls. Small holes and nicks are easily fixed with a little sanding and some wood putty but larger holes must be patched. This is an easy project that doesn't require a professional or a lot of money. Wood paneling is a beautiful and decorative addition to any home. Remove the wood moulding from the sides, top and bottom of the damaged panel. A pry bar or screwdriver will work to lift the edges without snapping them. Raise the wooden strip and pull the nails out with a hammer or pair of pliers. Loosen the panel by lifting it from the bottom edge. Pull nails along the seams and edges. Be careful not to nick or scratch adjoining panels when pulling nails. Prepare the wall for a new panel by scraping off old glue and removing all the nails. A paint scraper will remove glue residue easily. Clean the wall thoroughly before setting in a new panel. Apply a thin layer of adhesive to the back of the panel. Set it in place and nail the panel to secure it lightly while the glue sets. Finish nailing along the seams, top and bottom edges. Finish by replacing the wood strips and moulding at the top, bottom and seams.